The preservation community of Montana has suffered four sad losses this year with the passing of Ruthann Knudson of Great Falls, Jack Lepley of Fort Benton, Kathy Doeden of Miles City, and Carrie Johnson of Butte and Arlington, Virginia. All worked tirelessly to preserve and promote history and preservation throughout their careers, and leave behind an impressive list of preservation projects that already have lasting positive impacts in their respective communities. Ruthann Knudson’s long career in anthropology and archaeology in the American West began with a job as a humble salad cook and seasonal ranger in Yellowstone National Park, Mesa Verde, and Bandelier National Monument. After earning her PhD in anthropology from Washington State University, she went on to teach anthropology, was a senior scientist at Woodward-Clyde Consultants in San Francisco, an archaeologist for the National Park Service, and superintendent of Agate Fossil Beds National Monument. She semi-retired to Great Falls, where she did anthropology consulting through her business, Knudson Associates. She also served on the Humanities Montana Board, became an adjunct faculty member at the Montana State University - Great Falls, and acted as the Friends of the Museum of the Plains Indian executive director. For her immense activism and dedication Ruthann was honored with the Margret Mead Award from the American Anthropological Society. Her talent and passion will be greatly missed by all. John (Jack) Lepley, archaeologist and long-time educator had a passion for both learning and teaching. After serving in the US Army he began his career in education and spent his career teaching biology at Fort Benton High School. He was recognized as a Shell Merit Scholar to Cornell University, and receive Montana's Outstanding Biology Teacher Award. 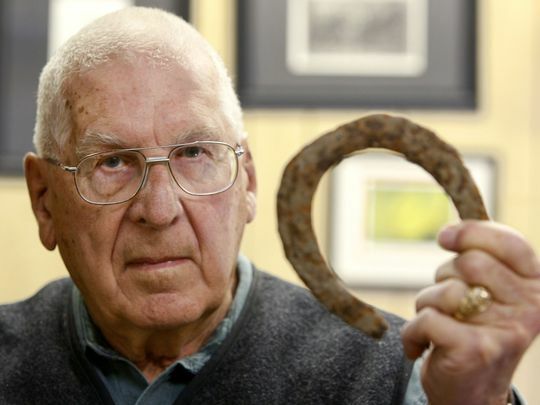 A Fort Benton native, Jack devoted himself to preserving the history of the area. Through his outstanding efforts, energy and foresight, much of the original fort at Fort Benton has been rebuilt, and he was instrumental in establishing the Montana Agricultural Center, Lewis and Clark Statue, Shep Memorial, and Levee Trail in Fort Benton. He was recognized for his ample community service and preservation work by the Montana Historical Society, the Museums Association of Montana, as well as the Montana Tourism Advisory Council. The lessons he taught the community and message he left behind won't soon be forgotten. Kathy Doeden, left with H. Rafael Chacon. Photo courtesy Kate Hampton, Montana State Historic Preservation Office. Kathy Doeden, a native of La Mesa, CA poured her heart into preserving Miles City. She was a bright and shining beacon of joy and determination to all of us who had the great pleasure of working with her. An enthusiastic promoter of arts and history, she participated in the rehabilitation of the Old Water Works building in Miles City into the Miles City Art Museum – a stellar project that continues to inspire preservationists and artists. Kathy was a founding member of the Montana Preservation Alliance, a member of the Custer County Society for Preservation and the Custer County Historical Society. In the 1990s, she became the first Miles City historic preservation officer, serving in that capacity for over a decade. She remained a member of the local preservation commission, and in 2001 began her 8-year tenure on the State Historic Preservation Review Board. Kathy also led the crusade, with Connie Muggli, to save the Miles City Northern Pacific Railway depot and to revitalize Miles City’s Main Street through local incentive programs, collaborating with local government and business owners, and simply never giving up. Her accolades and awards were numerous, but it is her love for historic Miles City that will be remembered. Carrie Johnson, a Milwaukee native and Smith College grad, lived and worked in the Washington, DC area for much of her life. As a Legislative aide, she was instrumental in helping to establish the Chesapeake and Ohio Canal National Historical Park, a success followed by a 5-year position on the Washington Post editorial staff, and subsequently a career as a freelance writer and a role on the Arlington Planning Board. In Montana, Carrie will be remembered as the author of Butte’s 1994 Regional Historic Preservation Plan, which was ground breaking for its broad look at heritage properties and potential for tourism development. For many years, she was a friend to all in the Butte preservation circles, and generously donated many volunteer hours to the Butte Public Archives and hosted guest researchers in her home.